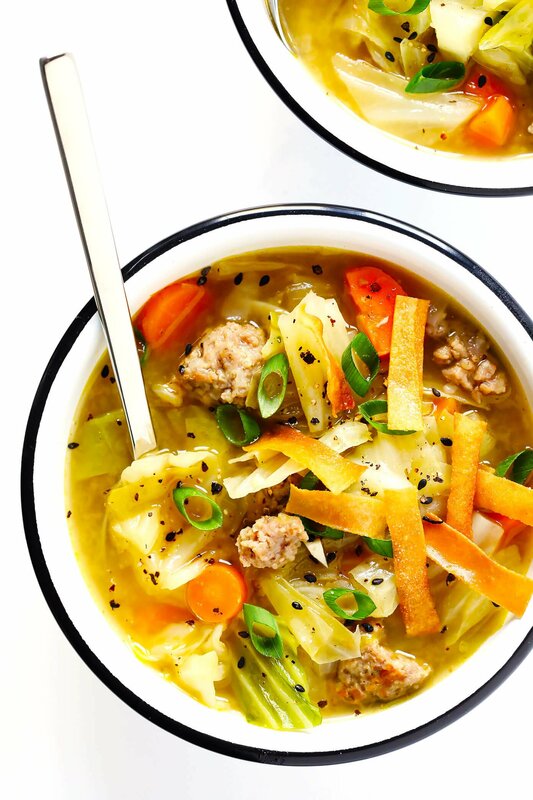 This Egg Roll Soup recipe brings together all of those irresistible egg roll flavors we love…in a soup!! It’s quick and easy to make, and easy to customize with pork, chicken, or mushrooms (<– if you’d like to make it vegan). 2017 has officially been deemed the Year Of The Cabbage Soup in our house. But this week, when the cabbage soup craving hit for the billionth time, I started thinking that it might be fun to try an Asian flare to this soup, maybe seasoned with some yummy ginger and toasted sesame oil and green onions, in lieu of my traditional Italian seasonings. And then it hit me — cabbage, pork, carrots, onions — these are all of the ingredients in egg rolls! 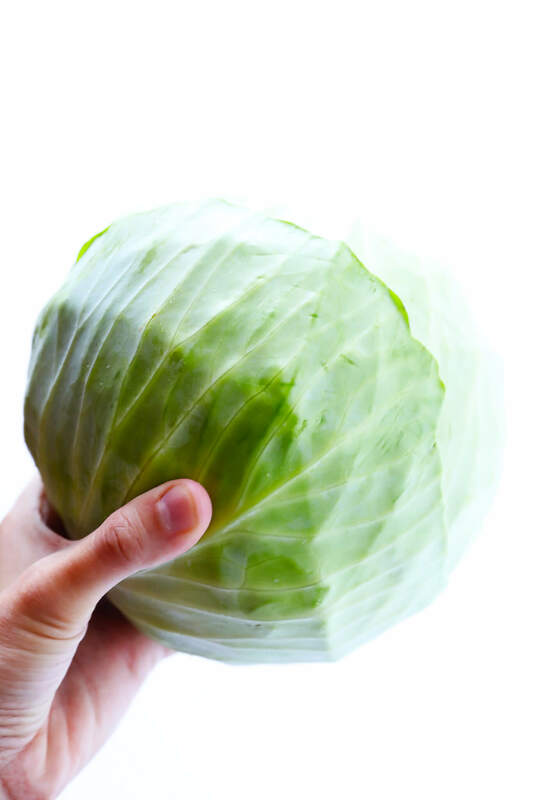 Why not just make an egg roll-inspired cabbage soup?! Maybe with some crispy egg roll wrappers (or store-bought crispy wonton strips) sprinkled on top?!? I mean, honestly, I don’t know how a soup could really go wrong with all of these flavors. But especially with that magical toasted sesame oil (affiliate link) sprinkled in at the end, this soup was downright irresistible. So savory, so fresh, and SO DELICIOUS. I just simmered everything together in the stovetop, and it was ready to go in a little over 30 minutes. But this recipe could also easily be adapted to the Instant Pot (pressure cooker) or slow cooker, if you’d like. I just recommend browning the pork on its own beforehand, then you can basically cook everything together afterwards. Also, if you don’t eat pork, feel free to sub in ground or shredded chicken instead. 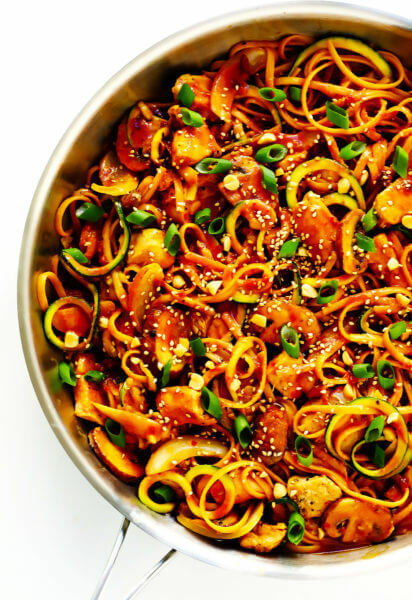 Or, a mix of baby bella and shiitake mushrooms (and/or crispy tofu) would be a fabulous other option if you wanted to make this meatless and vegan. Just like with traditional egg rolls, just about any protein will work here. Clearly, you have plenty of options here. So make this soup your own…and enjoy!! Add ground pork to a large stockpot and cook over medium-heat for 5-6 minutes, stirring and flipping occasionally, until the pork is lightly browned. Use a slotted spoon to transfer the pork to a separate plate, and set aside. Add the olive oil and onion, and stir to combine. Sauté for 5 minutes, stirring occasionally. Add the carrots and garlic, and sauté for 2 more minutes, stirring occasionally. Add the cabbage, stock, ginger, and cooked pork, and stir to combine. Continue cooking until the soup reaches a simmer. Then reduce heat to medium-low, cover, and simmer for 15 minutes, or until the carrots and cabbage are nice and tender. Stir in the sesame oil until combined. Then taste and season the soup with a few generous pinches of salt and black pepper as needed. 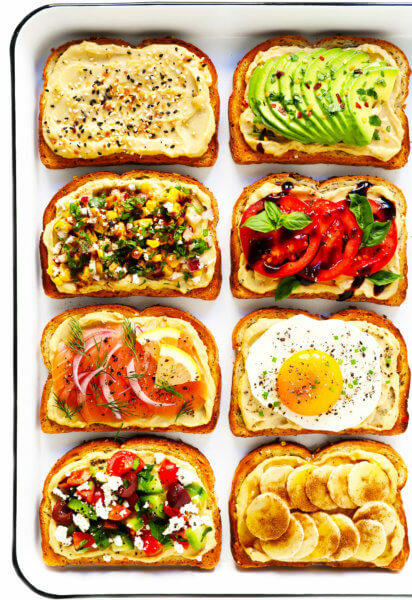 Serve warm, garnished with your desired toppings. Or refrigerate in sealed containers for up to 3 days, or freeze for up to 3 months. *Feel free to use ground pork (or pork sausage, or shredded pork), ground chicken (or chicken sausage, or shredded chicken), smoked sausage, or mushrooms in place of ground pork if you’d like. *To make homemade fried egg roll wrappers, just cut the egg roll wrappers into your desired shape/size. Then briefly fry (in your preferred high-smokepoint oil) until golden. How much time it will take on an average? YUM! 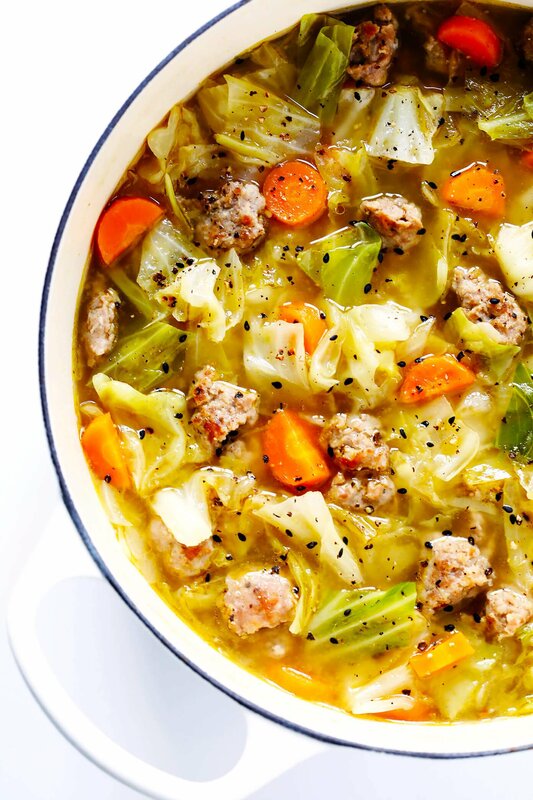 This is our new favorite soup! 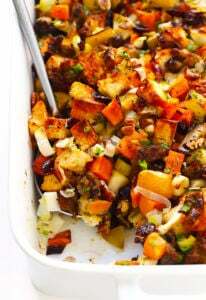 Everyone in our family (even the picky toddlers) devoured this! The only change I made was adding mushrooms (because I’m a huge mushroom fan), and adding a few dashes of soy sauce to our bowls before serving. Made it this week and it was delicious! Thanks for a great recipe! Delicious. I substituted Savoy cabbage and added 2 packs of crushed ramen noodles. Everyone ate too much, lol! I made this last night and love it! Thanks for the great recipe. 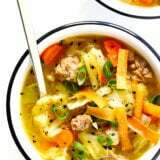 Where can I find nutritional info for the egg roll soup recipe? very good! I added some red pepper flakes to give it a tiny bit of heat and it was delicious! I made this tonight with shrimp. I did not have toasted sesame oil so i added Trader joe’s Spicy yuzu sauce for a kick. I think next time I’ll add mushrooms and do a pork/shrimp combo for more flavor. Also wish i had had ramen noodles or the wonton crisps. 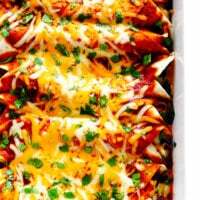 Very yummy and super easy to throw together! With chopping time, took 30 min total. And most of the time was just letting it simmer in the pot. Yummy and quick. Can’t get better than that. I used seasoned ground chicken and it added so much flavor to the soup. The broth was very nice with the ginger flavor. I definitely am going to be eating more of this soup as I don’t think the calories are very high. I think I will try throwing more veggies in next time too. Absolutely delicious! I used Jimmy Deans Italian Sausage! This recipe was amazing!!! I will make this again and again. I added some cremini mushrooms for added texture and flavor. OH MY GOSH IT WAS SO GOOD! I HAD TWO BOWLS OF IT! FYI we used hot italian sausage which spiced it up a bit loved it!!!!! Bravo! This is one tasty soup. I added 1/4 cup rice wine. Added wonderful flavor. This is going to be a regular my house from now on. Great recipe! I used pork sausage & sauted the onion, garlic & carrots in regular sesame oil. Also used no sodium chicken broth & only needed to add 1/2 tsp salt. Great flavor, will definitely make again. We enjoyed this soup this weekend. Very simple and quick to put together, however, I felt it needed some acid. So I added some rice wine vinegar to the soup and this made it perfect. Thanks for the recipe, Ali! 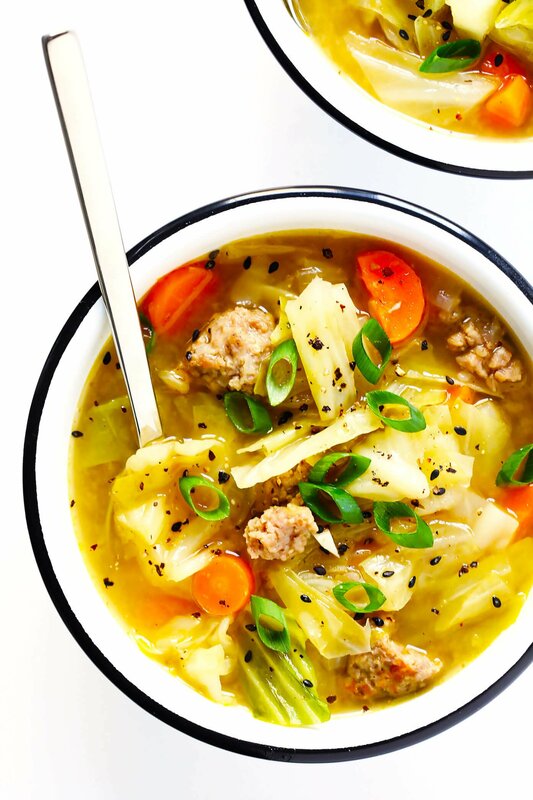 Pingback: 45 Weeknight Dinner Solutions for Busy Moms – Skinny Ms.
Incredibly easy soup to fix but lacked pizzazz so we added a splash of soy sauce, chili garlic sauce, and lots of pepper. It was very hearty and made enough for lunches the next day. Definitely recommend the wonton toppings and green onions. Thanks for an easy, filling, and inexpensive meal! This was REALLY good and easy to make. I had extra veggies (peas, mushrooms & bok choy) that I needed to use up so I threw them in. It’s a great recipe that you can tweak depending on the saltiness you like- we like salty so I added some soy sauce and then served over ramen noodles. YUM! It has landed a spot in my soup rotation, thanks for the great recipe! Whoa….delicious!! We loved this soup. Soooooo good. I pinned this abt a year ago. And kept saying I’ll do it one day. I am now kicking myself for not doing it sooner!!!! I added red bell pepper. Used fresh ginger. OMG I almost forgot to make it a little more hearty I added pre made pot stickers. And for add ins- cilantro and a slash of lime. My new favorite soup!!!!!! Made this for the 1st time and it is EXCELLENT! Tastes just like an eggroll. I used chicken breast and leftover pork loin rather than ground pork. It is going to be a regular in my house….Fast, delicious, healthy!! !